Hundred-and-Twenty-Ninth Sidra՚, the additional offerings continued. Hundred-and-Twenty-Sixth Sidra՚ (Num. 25:10-26:51): Pinaḥas' reward and the war against the Midianites, and the second census. Parashat Pinaḥas is a direct continuation of the previous parasha. YHWH informs Moses that Pinaḥas son of Elՙazar son of Aaron the kohen, by his actions had turned YHWH's fury away from the Children of Israel, "in his zealousness with My zeal in their midst; I did not finish off the Children of Israel in My zeal" (Num. 25:11). Therefore, since Pinaḥas was zealous for God, YHWH will bestow upon him and his seed that comes after him His Covenant of Peace - a covenant of everlasting priesthood. In other words, the prerogative of the High Priesthood belongs to Pinaḥas and his male descendants only and not to any other priestly line descended from Aaron. The name of the Israelite man whom Pinaḥas killed was Zimri son of Salu a Nasi of a Fathers' House of the tribe of Simeon, and the name of the Midianitess was Kozbi daughter of Ṣur a leader of the people of a Fathers' House in Midian. YHWH tells Moses to harass the Midianites and to strike them, because they harassed Israel with their craftiness in the matter of Poՙor and Kozbi. After the plague, YHWH tells Moses and Elՙazar (who is now Kohen Gadol) to take a head count of the Community of the Children of Israel, every male from the age of twenty years and upward according to their Fathers' House. The census takes place in the Plains of Moab beyond the Jordan by Jericho. This is the second census; the first census was thirty-eight years previous on the first day of the Second Month in the second year after the Exodus. Hundred-and-Twenty-Seventh Sidra՚ (Num. 26:52-27:14): Dividing the land, census of the Levites, land inheritance for daughters, and Moses is to prepare for death. YHWH tells Moses that the land of Canaan shall be divided as an inheritance amongst the tribes according to lots. The quantity of land allotted per tribe is to be proportional to the size of the tribe, hence the reason for the recent census. The Levites are not included in the census of the Children of Israel since they will not receive a landed inheritance in the midst of the Children of Israel. Therefore, a separate census is also taken of all Levite males from the age of a month and upward. 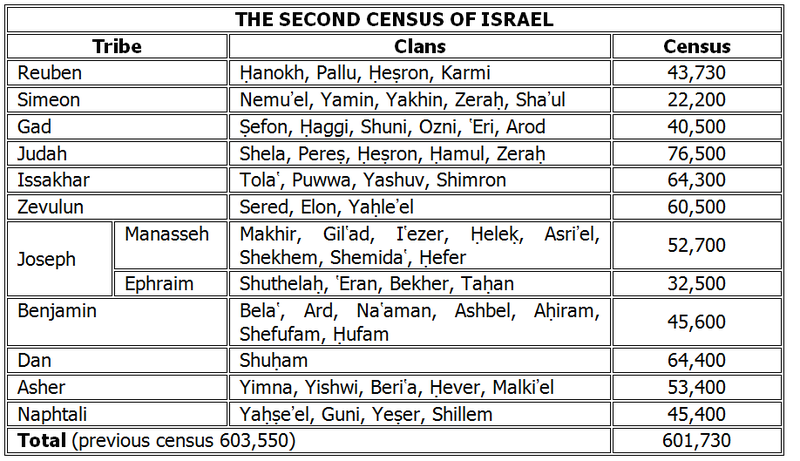 The total number of Levites in this age bracket is 23,000, an increase of 700 from the first census. Apart from Kalev and Joshua, all those included in the first census have already died in the wilderness, because they trusted in the report of the lying scouts rather than in the word of YHWH. Now the daughters of Ṣelofḥad son of Ḥefer son of Gilՙad son of Makhir son of Manasseh son of Joseph approach Moses and Elՙazar. The names of Ṣelofḥad's daughters were Maḥla, Noՙa, Ḥogla, Milka and Tirṣa. Ṣelofḥad's daughters stand before Moses, Elՙazar, and before the men and all the Community, at the entrance to the Tent of Appointed Times and say to them that their father died in the wilderness, but not through Ḳoraḥ's rebellion, but rather because of his own sins, however he did not have any sons. Consequently, why should his name be withdrawn from amongst his clan, just because he did not have a son? Therefore, his daughters instead should be allotted a landed inheritance amongst their father's brothers. Moses brings their case before YHWH. YHWH tells Moses that the daughters of Ṣelofḥad speak right and should be allotted a landed inheritance amongst their father's brothers, therefore their father's landed inheritance is to be transferred to them. "And to the Children of Israel you are to speak saying, when a man dies and a son he does not have, you are to transfer his landed inheritance to his daughter" (Num. 27:8). However, if he dies childless then his landed inheritance goes to his brothers, and if he has no brothers then it goes to his father's brothers. If his father has no brothers then the man's landed inheritance becomes the possession of the nearest relative from his clan. YHWH tells Moses that he is to ascend Mount ՙAvarim [עֲבָרִים - passes] and he will see the land that He has given to the Children of Israel. After Moses has seen the land he will be gathered to his people just as was Aaron his brother, since he rebelled against YHWH's word in the Wilderness of Ṣin at the waters of Merivath Ḳadesh [Quarrelling at Ḳadesh]. Hundred-and-Twenty-Eighth Sidra՚ (Num. 27:15-28:25): Joshua to replace Moses as leader, and the daily and additional offerings. Moses then requests from YHWH - Whom he address as 'God of the spirits of all flesh' - to appoint a man over the Community; "who will go out before them and who will come in before them, and who will lead them out and who will bring them in; and the Community of YHWH will not be, like a flock, that has no shepherd" (Num. 27:17). YHWH tells Moses to take Joshua son of Nun, "a man in whom the spirit is" (Num. 27:18), and to lay his hand upon him. Joshua is to stand before Elՙazar and before all the Community, and Moses is to commission him before their eyes putting some of his majesty upon him - in order that all the Community of the Children of Israel will heed him. "And before Elՙazar the kohen he will stand, and he will seek for him by the judgement of the ՚Urim before YHWH; by his word they will go out and by his word they will come in he and all the Children of Israel with him and all the Community" (Num. 27:21). Hundred-and-Twenty-Ninth Sidra՚ (Num. 28:26-30:1): The additional offerings continued. 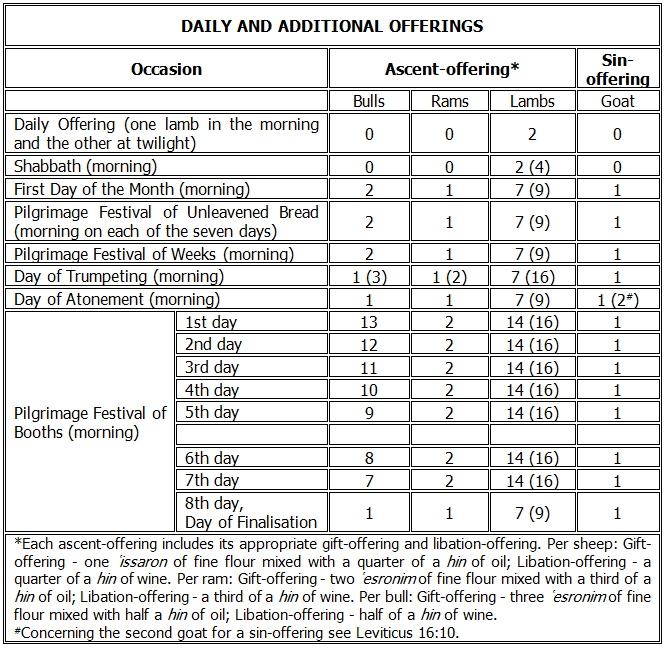 The figures in the above table are cumulative, for example on the Shabbath; 2 lambs for the Shabbath offering plus an additional 2 for the Daily Offering, making a total of 4 lambs. If any of the above occasions fell on the Shabbath, then the offerings for the day would include the Daily Offering, the Shabbath offering, and the offering for the occasion. The offering on the Day of Trumpeting would consist of the daily offering, the offering for the first day of the month, as well as the offering for the occasion. In today's society where it is up to the individual how they want to lead their lives, Pinaḥas' actions would have cost him dearly, if they want to be promiscuous - well that's up to them! The live and let live attitude of western civilization would have condemned him as a belligerent out to destroy the chosen life-styles of the citizens of our liberal society. "What's wrong with him?" would be the call, "He's a mad man, a religious fanatic", would be the response, "He should be locked-up for what he did, it's murder there's no excuse!" would be the answer. However, YHWH does not condemn Pinaḥas, but in fact rewards him and his male descendants after him with the High Priesthood, come Elՙazar's demise. Pinaḥas' action is not portrayed as one committed through unbridled anger, in fact, no emotional state is attested to him, but YHWH does describe his action as being zealous for Him - in other words righteous indignation. Pinaḥas understood the full ramifications if he refrained from taking certain action. This was not a difference of opinions, but a matter of life and death. Already YHWH's burning anger had been ignited. The people were dancing the dance of Baՙal of Poՙor, their separateness was being diminished, and their holiness extinguished. The decay, decadence, and disloyalty to YHWH had to be stopped before it suffocated our very soul. By Pinaḥas' action, the plague was abated after it cost Israel 24,000 lives, quite a price to pay for dancing the dance of Baՙal of Poՙor. The act and reward of Pinaḥas should not be seen as an invitation to be a vigilante, thrusting spears through the bellies of the sexually promiscuous, but as an invitation for us to live our lives like Pinaḥas as one who is, "in his zealousness with My zeal" (Num. 25:11); rather than one dancing the dance of Baՙal of Poՙor.